Gross Area: 220,000 sq. ft.
Area Per Student: 183 sq. ft. Pick your metric or national publication, Louisiana public schools traditionally fall near, or at the bottom of state education system rankings. From 2010 to 2015, many communities like East Baton Rouge were losing students to either private schools for better educational opportunities or the streets, and a radical change was necessary to retain students through graduation. The vision for the new Lee Magnet High School replaced an aged industrial high school with a new delivery model focusing on specialized learning for students. East Baton Rouge Parish School System is the second largest public school district in Louisiana with approximately 43,000 students. East Baton Rouge Public School System (EBRPSS) is located in the capitol city of Baton Rouge, which is a major industrial, petrochemical, medical, research, motion picture, and growing technology center of the south. In addition, Baton Rouge is home to Louisiana State University (LSU), the state’s flagship university; Southern University, one of the oldest, historically black universities in the nation; and Baton Rouge Community College, one of the fastest growing two-year college systems in the nation. Lee Magnet High School is self-touted as a school like no other. 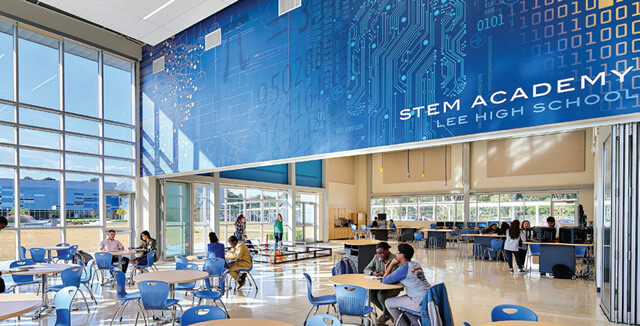 From its approach to learning to its collegiate-styled campus, Lee Magnet High School is poised to be both a showpiece for the district and a launch pad for a new generation of thinkers, dreamers, and student entrepreneurs. The campus is designed to promote real-life experiences, allowing students to apply classroom lessons in a specialized laboratory within their home Academy. 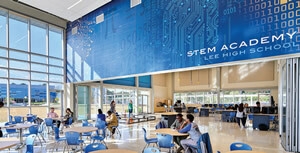 Lee Magnet High School is not just a facility, it is designed as an experience to inspire learners of all ages. The campus encompasses three Academy buildings and a Community Commons building. The pinnacle of student collaboration and real-life learning is found within the Academy WOW! Spaces, where students translate their knowledge by participating in student driven projects and presentations. Instructional spaces feature touch boards, flexible furniture, writable surfaces, and the most up-to-date technology to give students access to the latest learning tools available. At Lee Magnet High School, students have the opportunity to choose a space that best suits their current activities. The physical environment itself is different from a traditional high school; it is designed to resemble a community college or a Silicon Valley startup, placing the emphasis on learning through projects and applying scientific data and research. 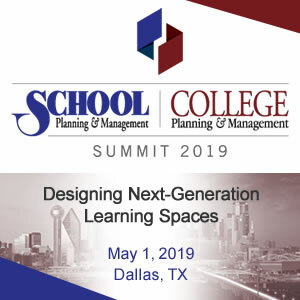 Students spend their day in spaces that resemble higher education and workplace environments to help connect their learning to the next level. 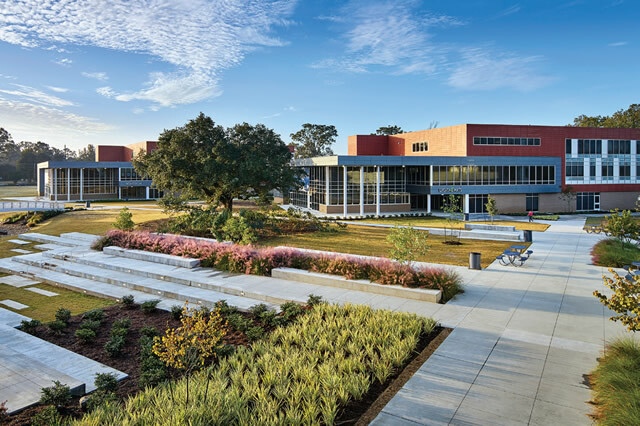 The new Lee Magnet High School campus design creates more personalized learning communities, referred to as Academies, within the greater high school. These smaller Academies support relationships among students and staff, foster collaboration, and boost innovation. Each Academy has a highly-focused curriculum that aligns with relevant career pathways, including: Digital Arts, Bio Medical and STEM. 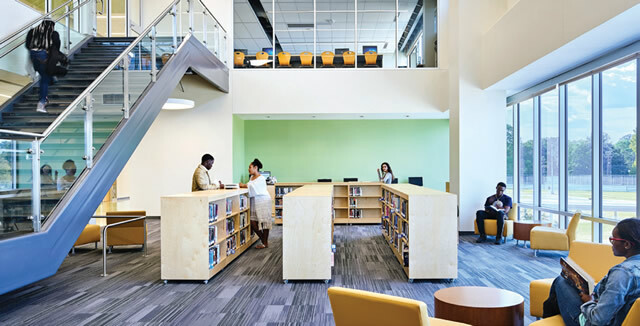 A variety of sizes and configurations of spaces enhance the student experience and provide a flexible learning environment to meet the needs of all students. Students can participate in seminars, projects, or blended learning activities. Operable walls, transparency, and natural daylight fill the Academies. Visual connections in learning labs and specialized spaces give students a reason to become excited about learning. 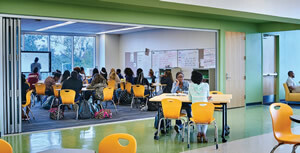 Floor to ceiling operable glass walls allow quick and effortless connection between collaboration and focused learning environments. The high school campus is organized around the existing green space on the site. Each Academy fronts this green space while the Commons Building creates a terminus for the campus. The existing site contained several live oak trees that were critical in saving throughout the design. Public and private space is clearly defined and provides opportunity for community involvement. The strategic location of the small commons and specialized learning lab allow these spaces to be accessible for community use, presentations, and interaction. Movement between spaces is critical for the interdisciplinary Academies and supports collaboration. Transparency between spaces as well as operable walls foster a fluid environment to support the flow of students learning in different modalities. Flexible WOW! spaces in each academy rein­force the school’s signature “Like No Other” tagline. These 3,000 quare-foot, tech-ready, student-centered studio spaces are the showpiece of each academy. They are designed to accommodate student-driven projects and presentations as well as those spearheaded by professional and higher education partners. These spaces have a direct connection to specialized learning labs—allowing the space to be transformed into various configurations and uses. Two story glass walls fill the space with daylight and illuminate large super-graphics showcasing each academy’s curriculum. LSU and the District had a vision for the WOW! spaces. For instance, in the engineering academy, the vision is to include 3D printers, as well as full-size mills and latches that are identical to the ones students use at LSU to ensure a seamless transition from high school to college. The 3D printers are installed, and ongoing fundraising efforts are underway to purchase the mills and latches. During this time, students are utilizing virtual equipment to explore the inner workings of the mill without the lid on. Adjacent to the Social Commons, the Specialized Learning Lab is strategically located to allow public access for greater connection to the community. The public space has sweeping views of the campus and an integral connection to the Specialized Learning Lab. These labs are outfitted with the assistance from LSU to provide students with learning environments that relate to the next level of either higher education or the workplace. The Social Commons components of each Academy provide venues for dining and informal student gathering. The intent is to help establish a positive and unifying culture, support positive and nurturing relationships, and aid in the social and intellectual development of students and staff. Facilities used by all students and staff are collected in the Community Commons building. Shared functions include fitness, physical education, and health. The Community Commons building also contains elective classrooms, music rooms, and additional art space. A large pre-function gathering space features with terraced seating, booth seating, four-top tables, and a lounge area. To support visitor orientation, a welcome center is prominently located to greet visitors, volunteers and community members. Facilities for food services, building maintenance and deliveries are also included in the Community Commons building. Useful indoor courtyard spaces. Nice outdoor spaces. Great transparency. Good use of graphics. 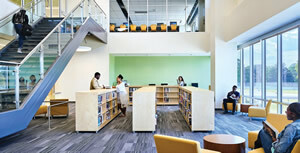 Variety of sizes and configurations of spaces provide a flexible learning environment to meet the needs of all students.